Our co-editor Emily Guise models proper reading form. 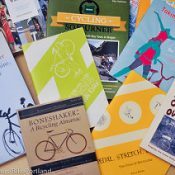 This summer reading list was created by Catie Gould and Emily Guise, BikeLoud PDX volunteers and co-editors of our Adventures in Activism column. Summer is a great time to relax by the pool (fountain, river, lake, sprinkler, or whatever) and still get nerdy about transportation and land-use. What could be better? Why are the suburbs so awful? Kunstler holds no punches, decrying cookie cutter strip malls and cartoon architecture as the “greatest misallocation of resources the world has ever known”. From the first American suburb to now, get a thorough history lesson on how things went so awry and envision how to restore civic life in these forsaken places. For a teaser, check out his fiery TED talk. From one development project to the next, the slow march through our historical segregation through official mortgage lending, zoning, and housing programs is going to change how you see your neighborhood forever. Which is a good thing, because it very likely has a racist history that still affects people today. Power through the feeling of being punched in the heart to the end where we look forward to what’s next for housing justice. Ted Wheeler asked in a recent Vision Zero briefing why New York City is making more progress than us. The answer is here: strong political leadership. Former NYC Transportation Commissioner Sadik-Khan walks us through her BetterBlock-style street transformation projects and dealing with the public backlash in the process. If you work at PBOT or City Hall, or criticize people who do, this is a must read. Walkers are an indicator species of a good street, and details matter a lot. Speck thoroughly examining every aspect of walkability, from one way vs two way streets, to parking pricing, to the ROI on street trees. 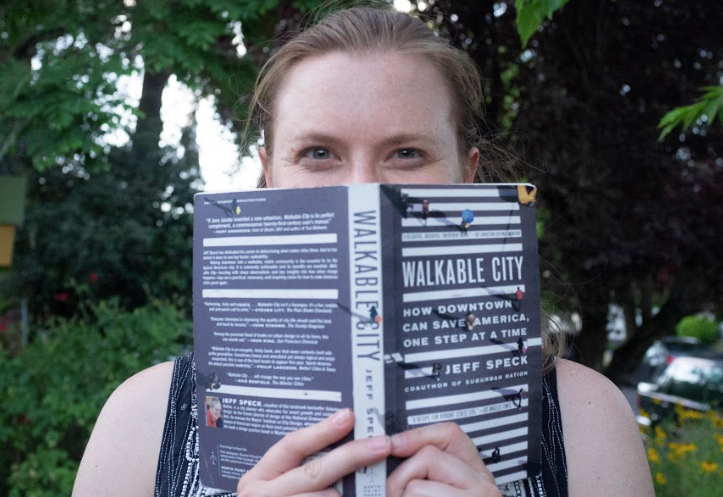 Loaded with details, this book is not just an enjoyable read but a comprehensive guide for fixes to improve walkability that you’ll want to revisit again and again. Read with a pen handy. A thorough look at the history, economics, psychology, and more of traffic and how this seemingly innocuous, mundane activity actually has huge implications for our mental and physical well-being, our wallets, and our economy. You won’t be able to think about traffic the same way after reading this one- especially the very compelling argument for the ‘late merge’ technique. 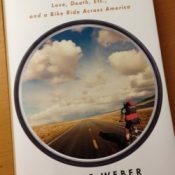 A concise argument in book form for why and how bicycling can kickstart local economies through boosting development and growth, and strengthen local communities by offering the freedom of a viable, non-car transportation option. Written by local bike luminary (and former BikePortland editor) Elly Blue. One of the indispensable pillars of the new urbanist movements, Jacobs was a noted community organizer whose timeless observations of street life-her famous ‘sidewalk ballet’-are backed up by serious research and with an easy-to-read style courtesy of her journalistic background. This was her first book and it should be on every advocate’s shelf. Our physical environment shapes everything: From how much we trust our neighbors, to how many friends you have. What roles does architecture play? Or public transit? When our cities are at their best, so are their residents who live in them. Loaded with studies on the science of happiness and urban design examples, you’ll be sure to learn a lot of great facts sure to impress your non-transportation friends at parties. Former Portlander Jordan provides a fascinating look at cycling in the cyclists’ city, Amsterdam, from its beginnings in the 1890s, to the critical political street space protests and political action of the 1970s, to the continually evolving bike infrastructure of today. A sobering, but very necessary history of the Portland neighborhoods of inner North and Northeast. It explains how redlining, predatory lending, highway building, housing speculation borne of discrimination against Portland’s small Black community led a once thriving area to become a ghetto. It also examines how in the 1990s, low housing prices and neighborhood reinvestment opportunities quickly gentrified the neighborhoods while displacing long-time residents. A must read for anyone living in Portland. Good list. I would add Bicycle Diaries by David Byrne. For your consideration: Peter Norton is a great historian on the history of car culture in the US. He gave a great keynote at NACTO last year that I found on YouTube: https://www.youtube.com/watch?v=Iiv5vOBb6Aw. I read Fighting Traffic. there’s a lot of great information in there, but I think a heavier hand on the part of an editor would have improved it dramatically. Ivan Illich’s book, ” Tools for conviviality” where he first uses the term “radical monopoly” to describe technologies like the automobile that make alternative methods or technologies nearly impossible. I’d add The Power Broker by Robert Caro. The High Cost of Free Parking by Shoup (and perhaps Parking in the City). Fire at Eden’s Gate by Brent Walth. Evicted by Matthew Desmond. Some good ones there. I definitely second Geography of Nowhere (despite occasional tangents complaining about the ugliness of car oriented development when the real problem is its functional deficiencies) and Traffic. I might also have to check out Walkable City after seeing this list. Additionally, I would recommend Pedaling Revolution by Portland’s own Jeff Mapes. There were some great “aha!” insights for me in there. I have no problem with Jacobs’ opposition to freeways and concrete urban deserts but I find the juxtaposition of “Color of Law” and “The Death and Life of Great American Cities” to be ironic. IMO, Jacobs’ obsession with preserving neighborhoods and encouraging bourgeoisie renewal (e.g. “good gentrification”) served as one of the main inspirations for the waves of economic redlining and displacement that decimated diverse urban neighborhoods. When I first read The Life and Death of American Cities I also found myself asking questions about gentrification that were not touched on her book. I think the two make a great pairing. I don’t think it’s fair or accurate to saddle Jacobs “as one of the main inspirations for the waves of economic redlining and displacement that decimated diverse urban neighborhoods.” First of all, redlining and segregation long preceded her time. And in making neighborhoods walkable and livable without a car, her efforts have done much to save American cities. If our cultural prejudices, racial fears and capitulation to the wishes of developers and other private interests allow unjust and oppressive forces to gain control it’s hardly the fault of those with a vision to make cities fit for human habitation and establish a meaningful quality of life in them! If anything Jacobs courageous stand in 1950’s and 60’s New York was precisely the opposite! She stood alone at first against a great villain of mid-century America, Robert Moses, who wanted to and largely did eviscerate the hearts of countless wonderful ethnic communities across the nation. All done for the Federal Interstate program in order to facilitate white suburbanites flight to the suburbs while allowing “easy” assess to the city with their cars. Dozens of American cities have yet to recover from this, and some likely never will. Eisenhower, the force behind the Interstate system did not even imagine it going into, much less obliterating swathes of the urban fabric. Moses is possibly the most unrecognized force for malevolence and destruction in 20th century America. You greatly misread history here and use only the lens of present conditions and project it backwards, so distort the course of events. the problem is that this vision benefited wealthier white people and displaced existing residents, again, and again, and again. it’s not as if there is much debate about what happens to housing costs when one emphasizes quaint “neighborhood character” and urban renewal via incentivization (shamefully, often via direct subsidy) of cafes, restaurants, bars, boutiques, garden/home furnishing stores, yoga shalas, doggie day care centers etc. Dense, pedestrian-friendly spaces don’t have to be accessible only to the affluent, of course. But without commitments to affordable and public housing and even the regulation of rent, any change to a neighborhood that increases its real-estate values will inevitably lead to increased urban inequality. When we boil down Jacobs’ ideas to their simplest dictates, we risk those unsavory consequences. Exactly, so don’t boil Jacobs down to her simplest dictates, and don’t fault her for not having foreseen the cynical games of real estate development that ensued as cities, rather than suburbs, became the desirable place to live in America. I think we can agree that this in every respect is and was a desirable outcome, unless you’re prepared to tout strip malls cul de sacs and suburban sterility as superior to city life. That is hasn’t been done fairly or equitably is too obvious to state, but we evidently hold different forces to blame for it. Robert Caro: The Power Broker (Robert Moses and the Fall of New York). 1,144 pages plus notes and index, but a great read nevertheless! Like it or hate it, Moses had a profound influence upon the creation of a car-oriented suburban America, but more importantly, the creation and politics of Metropolitan Planning Organizations like Metro/JPACT, PSRC, and the numerous GOGs, as well as the present bland scenic design of our interstate highway system. Napoleon, Moses, and Jacobs, among others in our pantheon of “great planners”, all meant well, and have had profound influence on our present-day physical environment. And all are controversial with numerous detractors, including Jane Jacobs. He seems like a jerk. He had some valuable things to say, but ick. It’s light but fun reading, you might try “A Field Guide to Sprawl” by Dolores Hayden. Much heavier reading and long out of print (but I think there’s a copy at the PSU library) is one of the most profound and well-written (or well-translated) geography texts I’ve ever had the pleasure to read: “Urban Geography” by Jacqueline Beaujeu-Garnier, who died in 1995. My favorite antidote from reading Kunstler is to read “Writings on Cities” by Henri Lefebvre, a dead white guy from France, who wrote extensively about institutional racism and classism in cities, both in politics and in geography. Geography of Nowhere is a great read! Another great read, though a tad too thick, is Peter Hall’s “Cities in Civilization.” His chapter on early 20th century Berlin is especially good. It’s probably more technical than most people want for summertime reading, but I find the NACTO guides are actually very inspiring and well-written. My favorite is the Global Street Design Guide, but the transit, bike, and others are just as good. I LOVE the NACTO guides! They’re so thoughtfully designed and explain the concepts well. I’d also recommend “Bike Lanes Are White Lanes: Bicycle Advocacy and Urban Planning” by Melody Hoffman. I’ve used it now going on 3 years for the “Bicycles, Equity, and Race: Urban mobility in PDX” course I teach at Warner Pacific University. She has a chapter specifically on Portland which stems from her PhD research. Great book. This one, and Dr. Adonia Lugo’s Bicycle/Race are definitely on my to-read list! Thanks for the suggestion. Cities for People by Jan Gehl. I recommend birth control and less people moving here from the cities that they have previously destroyed. As long as “people” only interact with their devices this is all B.S. Ms Sadik-Khan did create lots of changes to NYC streets including some segregated lanes. However, she also made a lot of rookie mistakes with overly narrow bike lanes, dzbls and such. Still, it got the cycling rate in NYC all the way to 1.2% (ahem). However, if we’re talking deaths, which is the primary topic of Vision Zero, then I’m not sure why she’s in the conversation. As her work has been extended on, deaths of pedestrians and cyclists are rising in NYC. The bright spot is that NYC lowered its default speed limit to 25 mph from 30 mph. However, that came after Ms Sadik-Khan departed and the primary benefit appears to be in saving motorist lives. So, if one considers NYC to be making more progress on Vision Zero, then that’s got to be from a motorist perspective. Cyclists and pedestrians are being slaughtered at increasing rates in NYC. That’s hardly an outcome to aspire to. Perhaps those separated infrastructure builds are playing a role in the rising number of deaths of cyclists and pedestrians. There are certainly many intersection interactions that have been made horrific by the segregation, but we don’t like to talk about that, do we? Autokind vs. Mankind by Kenneth Schneider.